80%, 50%, 20% or less than 5%? When I ask businesses about the typical percentage of their Facebook fans that will be reached with a Post form their Facebook Page – very few people will guess that the correct figure. There’s a widespread misconception that if you are promoting content via your Facebook Page, the majority of your fans will see your content in their Newsfeeds. But that’s not the case. The average visibility for Facebook Page Posts is meagre – at an average of around 5%! That means that only a small percentage of a businesses’ Facebook fans will see a post from that Page in their news feeds. The reality for most businesses is that the marketing impact of their Facebook activity is limited if they rely on organic promotion only. Prioritising content to Facebook users that they are more likely to value and to engage with. Penalising poor organic content from Facebook Pages that users are unlikely to, or won’t engage with. For Facebook users, this is beneficial as it results in Facebook News Feeds being more tailored to their own personal friends connections. But while many would see this development as a negative one, it hides the wider and very significant opportunity presented by Facebook Advertising. What is Facebook Advertising and Why is it so Important? Firstly, let’s look at the value of using Facebook to promote your business. Facebook is the world’s largest social media network with a staggering 1.8 million people using the site. It’s THE network for reaching the public – around 65% of people in UK & Ireland use it, with very high daily usage rates. If you are a B2C business or organisation that is public-facing, you’ll want to be using Facebook effectively. We find Facebook marketing to be the biggest single marketing opportunity for B2C companies in Ireland. With the right products and promotion, Facebook is a genuinely powerful marketing tool that allows businesses to micro-target audiences quickly, effectively and in a way that stands out. It also offers the most cost-effective advertising on the market. What’s also great about quality Facebook advertising is that people are likely to like, comment on and share the advert and to promote to their friends on Facebook. The other key reason why Facebook advertising is so important is a major decline in the visibility of Facebook Page posts. While there are lots of Facebook Pages that enjoy good reach rates (publishers, entertainment-related businesses with excellent customer relationships etc), the fact remains that most Facebook Pages suffer from low marketing reach that can only realistically be solved by incorporating Facebook advertising. The real power of Facebook advertising lies in the ability to show your ads to a highly targeted audience on Facebook. During the advertising set-up stage businesses can micro-target the location of their users, key demographic information including gender, age and even marital status, and by their interests across a huge range of topics. One of the fascinating aspects of Facebook advertising is the ability to micro-target your target audiences on Facebook. 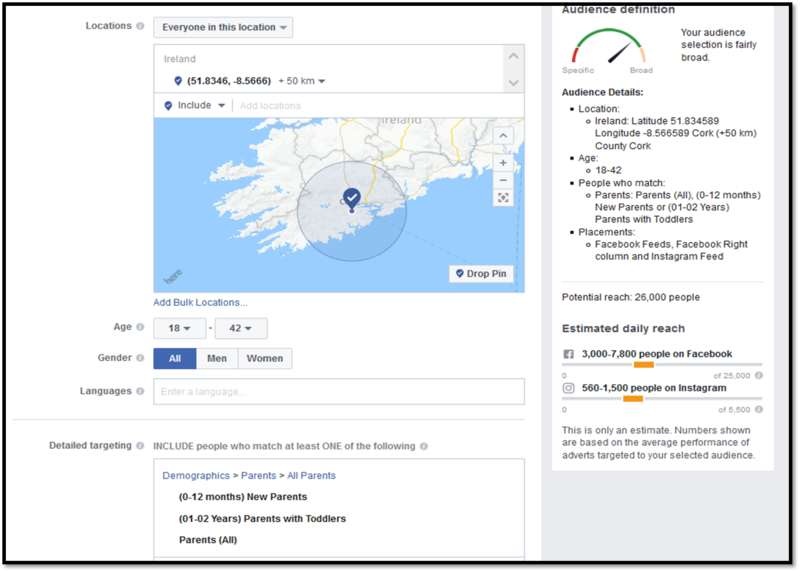 Facebook collect a huge volume of data on users – age, location, relationship status, interests etc, which in turn can be utilised by advertisers to create very targeted campaigns. In this example, I’ve selected an audience of parents, aged between 18 -42 based in County Cork. One of the most valuable developments in recent years has been Facebook Custom Audiences. The facility allows advertisers to build an audience of people who have visited their client’s website and remarket to them via Facebook. Facebook allows you to run adverts across its network – including on different devices and also on Instagram (which is owned by Facebook). Top tip: it’s easy to be led into running your campaign on all Facebook devices and sites, however it much better to manually review and select the platforms / sites that reflect your audiences. For instance you might not want to show your adverts to people using desktops or on Instagram, if it’s not right for your business. A simple, straightforward facility to control the amount you wish to spend and the duration of your campaign. Simply review and launch your campaign. Top tip: take care to double-check you have selected the correct preference for daily or lifetime campaign spend – you don’t want to confuse them. After your campaign has been launched you can check your advert performance and amend / optimise it to improve it. Want to find out how Facebook advertising can help your business? Contact Paul McGarrity on 07974 689642 (or 00353 1 6855942 in Rep of Ireland) for a dedicated consultation.